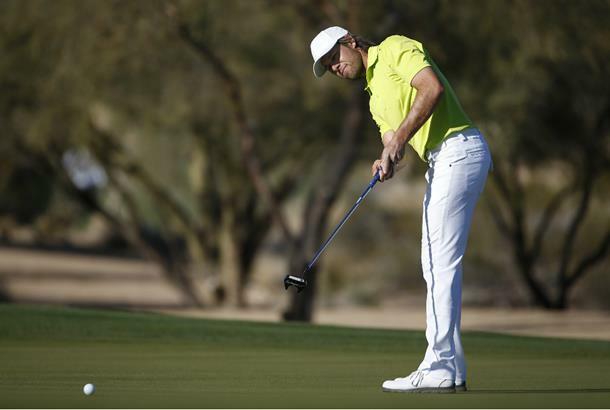 Based on the stats, Aaron Baddeley ranks as one of the greatest putters in modern golf. Last year, he topped the 'strokes gained putting statistic. In fact, since the start of his PGA Tour career in 2007, he’s only ranked outside the top-15 putters once, and he’s usually been in the top 10. I’m a big proponent of practising from inside 10 feet because then you’re going to make a lot of putts and when you see the ball going in constantly, it breeds confidence like nothing else. You need to practise that and give yourself good momentum going into a round. If you can putt well with one hand it’s going to get you in the correct set-up position. If you don’t putt well one-handed then you’re not in the right proper set-up spot. You might struggle at first, but as you keep practising your body is going to naturally move itself into the right spot. I approach putts like it doesn’t matter. Instead of telling yourself ‘Oh man I have to make this putt’ just be like ‘Hey, it’s just another putt I’m gonna make’ as opposed to feeling like you’ve got to get it in. It’s not easy to care less – like you’re not trying – but sometimes you need to try a little bit less to free yourself up. You have to be loose. That’s my thing with shorter putts. Find a speck of grass or a different piece from the paint on the hole. Then find a good trigger to begin your stroke. Mine is looking at the ball after I’ve looked at the hole and taken three strokes in my pre-shot routine. As soon as my eyes get back to the ball I take it back and hit it. I may do a minor forward press, but it’s not the overall trigger. I look at the ball and go. I’ve done it since I was 16, there’s no change or delay. All I read on a putt are the last few feet and how it’s going to go into the hole. I then just let my brain sort of figure out the rest. I don’t read it too closely. I don’t want to overdo the read, or try too hard if that makes sense. You can get the old saying ‘paralysis by analysis’. You don’t really think about how a ball is going to go into the hoop if you’re playing basketball, or a pass in football. You just think about delivering the ball to that person. We tend to over-think putting. 8. Try to make everything! If you’ve got a 50-footer and you try to get it in a three-foot circle around the hole, you miss by three feet and you’ve got six feet left. But if you try and make it from 50 feet and you miss by three, you’ve only got three feet left. It sounds simple, but that’s sort of the idea for putting. 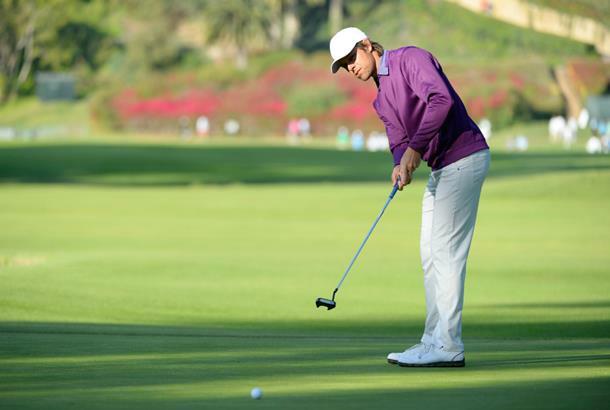 The putting stroke can sometimes only be about six inches long. You don’t have much time to adjust. In the full swing you have more time for adjustment. When you’re putting from three to five feet, your putting stroke is so short, you just have no time for adjustments. You need to have the proper set-up with the putter face aimed where you want the ball to go and that’s 90 per cent of it. Here’s a really good drill. Get three or four balls and start at 10 feet. Drop each one two feet apart, putt the first one and gradually work your way back to 50 feet. Learn what it feels like to hit those different putts. Do this as opposed to dropping balls down in one spot and whacking one six feet past and the next one six feet short. If you’re really struggling, start at two feet and end at 20 feet.